SOLD INDIVIDUALLY. 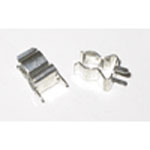 Replacement fuse clips for standard size 1/4 x 1-1/4-inch glass fuses, fast-acting (AGC) or slow-blow (MDL) type. PC board mount type. Original fuse clips in most old games can become oxidized, tarnished, and/or lose tension and grip on fuses over the years, which causes heat buildup, and eventual failure of the connection. Replace those old dirty, weak, or broken fuse clips in that classic game for added reliability and looks! Replaces Bally # E-00148-0021 and others.